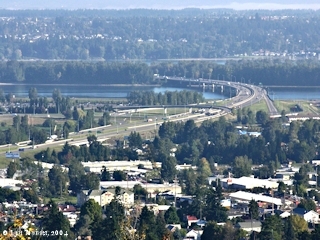 Click image to enlarge Interstate 205 and Government Island, from Rocky Butte, Oregon. Image taken October 14, 2004. 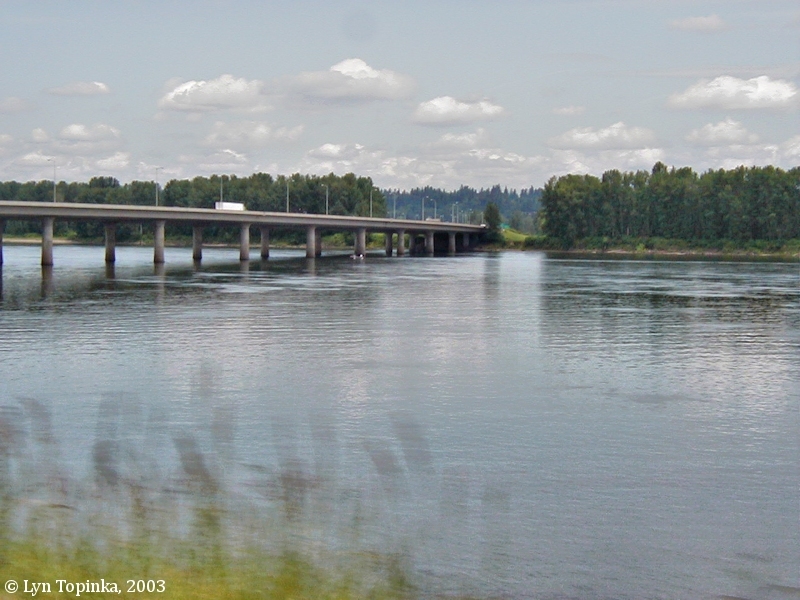 In 1977 groundbreaking began on the "Glenn Jackson Bridge" connecting Vancouver, Washington, to Portland, Oregon. 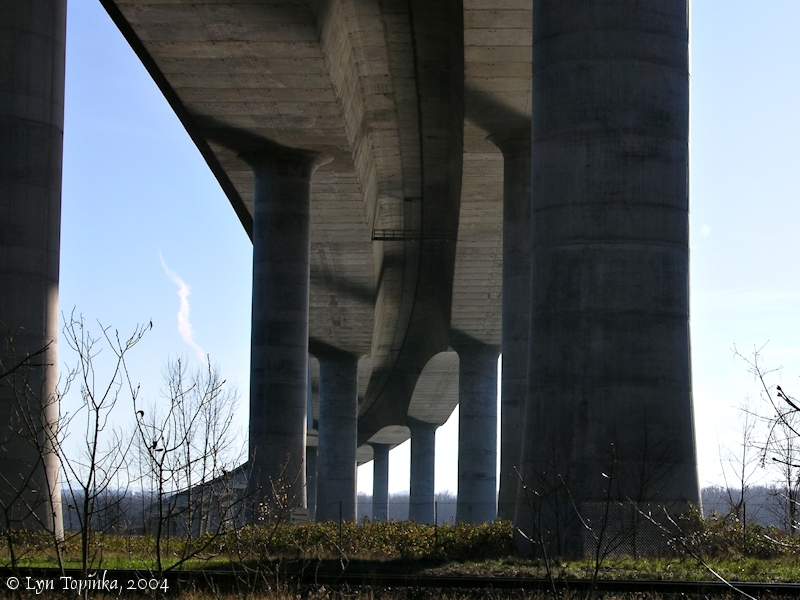 On December 15, 1983, the first cars crossed the "Interstate 205 Bridge". The bridge traverses Government Island. Total bridge length is 11,750 feet (a little over 2 miles), with the north channel section (Washington State to Government Island), 7,460 feet, the Government Island section, 1,170 feet, and the south channel section (Government Island to Oregon), 3,120 feet. Glenn L. Jackson, for whom the bridge was named, was the Oregon Department of Transportation Commissioner from 1959 to 1979. On November 15, 1977, the Oregon Transportation Commission named the I-205 bridge after their chairman, the only time know where ODOT named a bridge for someone who was not yet deceased. Glenn Jackson died June 20, 1980. Click image to enlarge Under the Interstate 205 Bridge. From the Washington shore looking towards Government Island. Image taken December 18, 2004. The Glenn Jackson Bridge crosses Government Island near the downstream end of the largest of the island complex. Upstream on the Washington side is the Vancouver Trout Hatchery and the small community of Fishers Landing. Downstream on the Washington side is Ellsworth, Image/Russell Landing, and Lieser Point. 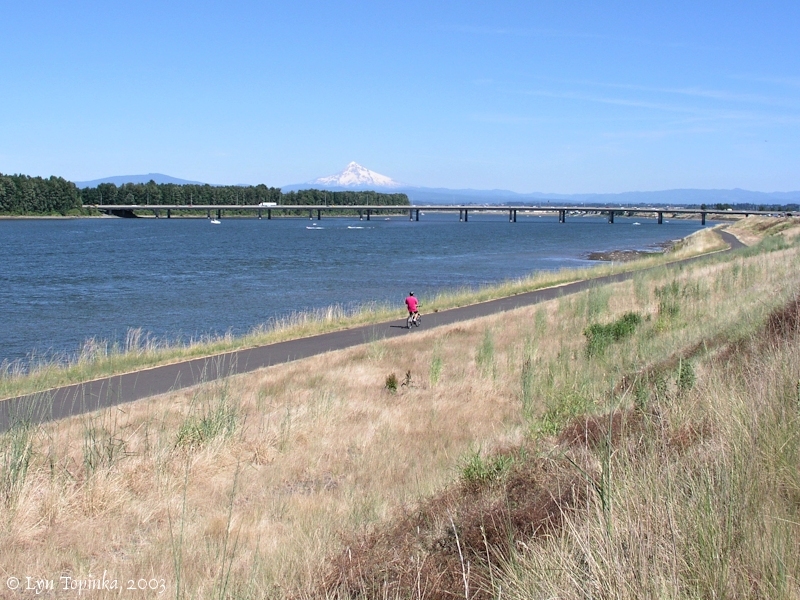 Upstream on the Oregon side is Blue and Fairview Lakes and Chinook Landing. Downstream on the Oregon side is the Portland International Airport. 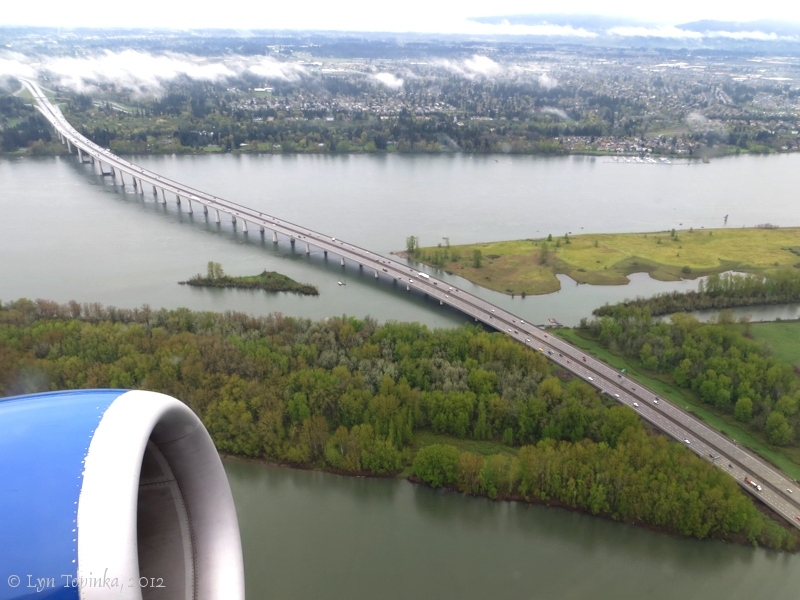 Click image to enlarge Interstate 205 Bridge crosses Government Island, as seen from airliner landing at PDX. Day overcast and drizzly. Image taken October 10, 2010. 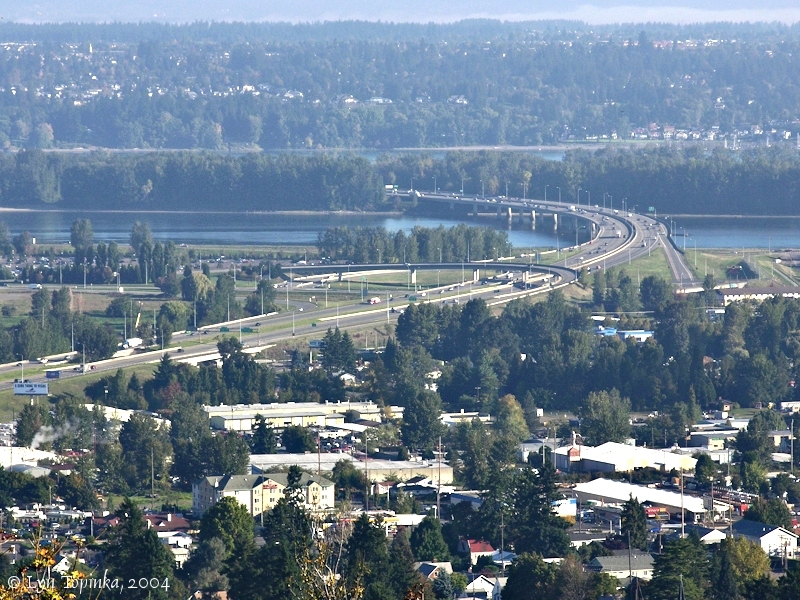 Click image to enlarge Interstate 205 and Government Island. View from airliner heading east from PDX. Mid afternoon, clouds, gray, and drizzle. Image taken April 24, 2012. 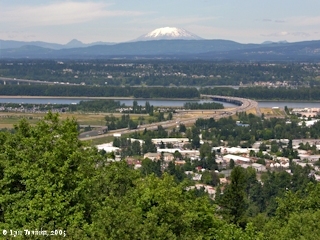 Click image to enlarge View north to Washington State, from Rocky Butte, Oregon. 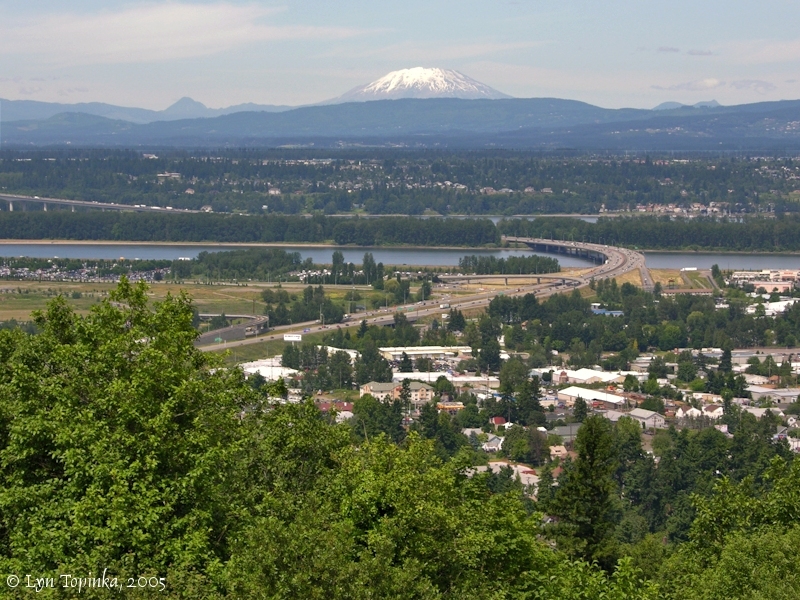 Mount St. Helens, the Columbia River, Government Island, and the Interstate 205 Bridge are all in this view looking north from Rocky Butte. Image taken June 15, 2005. 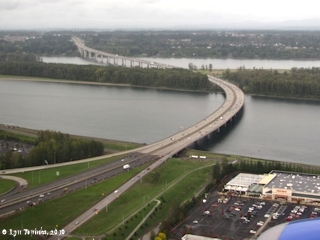 Click image to enlarge Government Island and the Interstate 205 Bridge. Government Island as seen from Marine Drive, Oregon. Image taken May 29, 2003. Click image to enlarge Columbia River, Interstate 205 Bridge, and Mount Hood, Oregon. 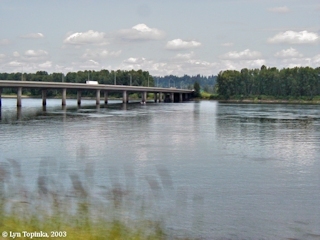 Downstream side of the Interstate 205 Bridge as seen from Marine Drive, Oregon. Government Island is to the left and the Oregon banks of the Columbia River are to the right. Mount Hood, Oregon, is in the background. Image taken July 5, 2003. Click image to enlarge Beach, Fishers Landing, Washington. Interstate 205 Bridge is in the background. Image taken November 23, 2005. Click image to enlarge Mount Hood, Oregon, and the Interstate 205 Bridge, from Ryan Point, Washington. Image taken December 18, 2004. 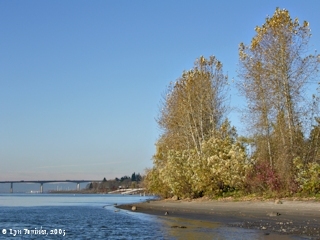 Click image to enlarge Washington shoreline as seen from Tidewater Cove. 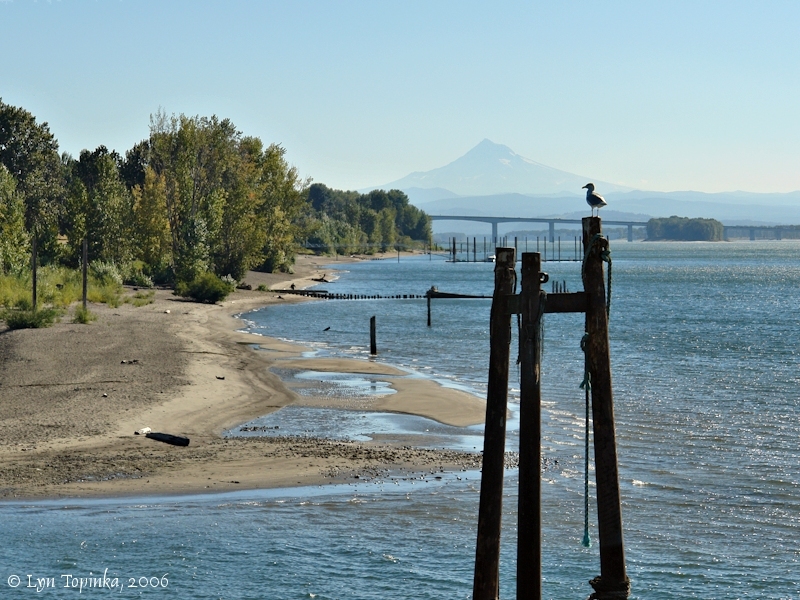 Mount Hood is in the background with the Interstate 205 Bridge in the middleground. Image taken October 9, 2006.